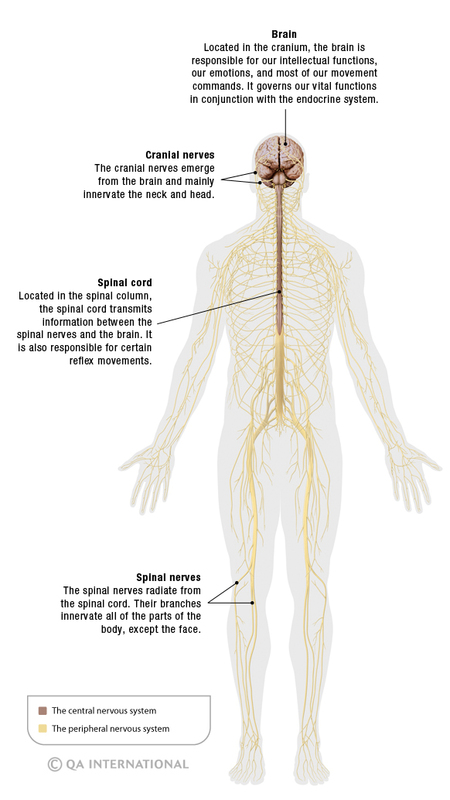 Functionally speaking, the nervous system is comprised of the somatic nervous system and the autonomic nervous system. The somatic nervous system, or voluntary system, makes it possible for the body to interact with its environment. It acts only on the skeletal muscles and governs voluntary movements, reflexes and semiautomatic movements (maintaining balance, posture, walking) as well as receives the sensory messages from the skin and the sensory organs. The autonomic nervous system regulates unconscious visceral functions: breathing, digestion, heart rhythm, blood circulation, excretion, etc. It acts on the smooth muscles (which enable the involuntary movements of the organs), certain glands, the vascular system and the heart muscle. In the nervous system, information is carried in the form of electrical and chemical signals by highly complex cells called neurons. The human body contains some 100 billion neurons, which form a part of the nervous tissue (the brain, the spinal cord and the nerves). 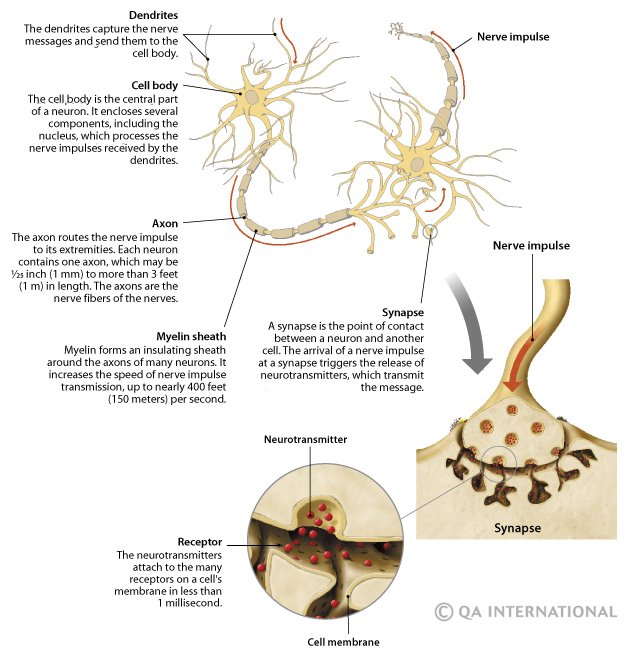 Although their shape can vary, all of the neurons have a similar structure: a cell body with extensions (dendrites and an axon), which provide for the reception and transmission of nerve messages. 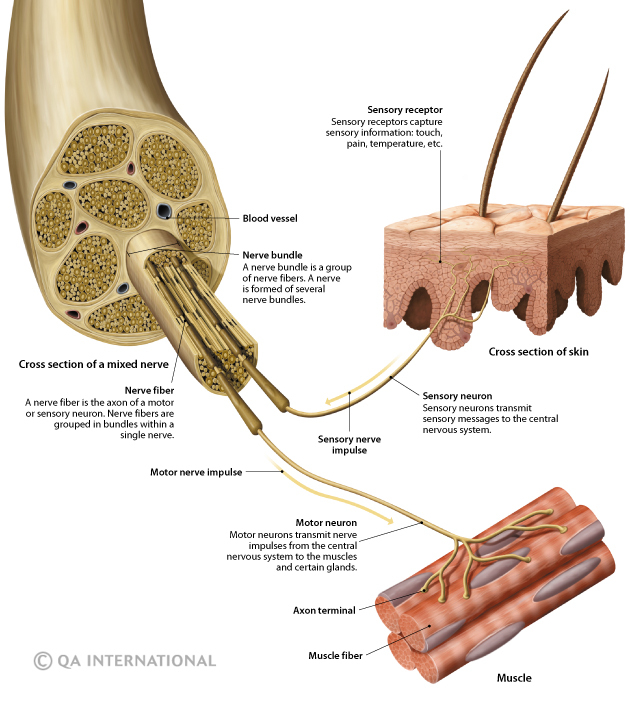 In the peripheral nervous system, these extensions form nerve fibers that make up the nerves. Neurons can only survive for a few minutes without oxygen, and most of them are unable to divide. The neurons differ from the other cells in the body by their exceptionally long life span. Even though, starting at birth, we lose many neurons every minute of our lives, some of them can, just like us, survive for more than 100 years! The spinal cord is formed by a cord of nervous tissue more than 16 inches (40 cm) in length located in the vertebral canal, inside the spinal column. 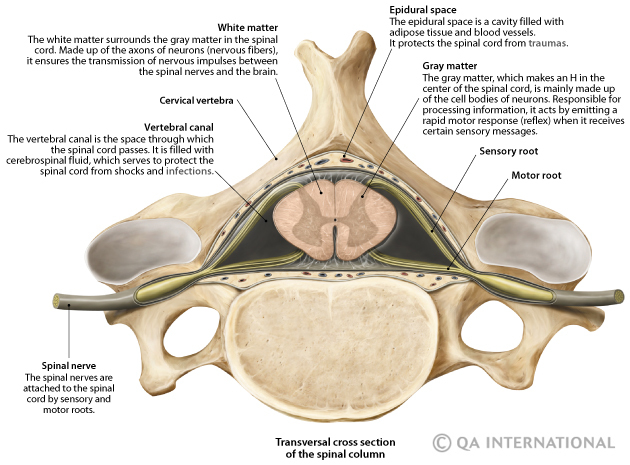 It spans from the spinal bulb to the second lumbar vertebra and is extended by a collection of nervous fibers, the cauda equina. 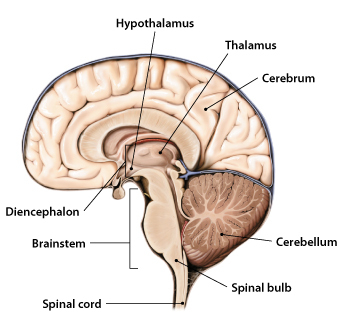 Composed of motor and sensory neurons, the spinal cord ensures the transmission of messages between the spinal nerves and the brain, in addition to being a reflex center. The spinal cord is elastic, and stretches during movements of the head and trunk. However, it is fragile and very sensitive to direct pressure. A lesion of the spinal cord leads to a function, motor or sensory loss, the extent of which depends on the location of the lesion.